In another life I reviewed a game called Ghost in the Sheet, and I remember that it was a bit of everything – a bit different, a bit silly, a bit ambitious. It was good, but not great, but promised a fair bit. Much of that promise is realised here. Half of the Cardboard Box is the man under the sheet; the Box as a whole has come up with J.U.L.I.A. 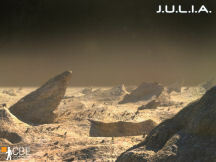 J.U.L.I.A is the artificial intelligence managing an interstellar probe in the year 2430. A signal suggesting life has been detected in a solar system not unlike our own, and a team of scientists are despatched on a long voyage to investigate. Except that Rachel Manners, 35 year old astrobiologist, is the only one now on board, having been awoken from a cryo sleep as a result of a meteorite strike. What comes next is about what happened before. Six planets are below, or they will be when the ship is repaired. Exploration of each will reveal secrets and surprises, some moral dilemmas, and will end in a rather large choice. Just before that point the game will prompt you to save, so you can go back and make the other choice if you are so inclined. Although exploration is the name of the game, as Rachel you never leave the ship. Mobot is the exploration robot of choice, and it’s through “him” that planetary interaction takes place. 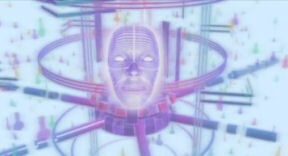 There is a constant stream of video and dialogue coming from Mobot, interpreted and dissected with the help of J.U.L.I.A. It’s a constant three way conversation, so despite the solitary nature of Rachel’s situation, she is not alone. Inside the space probe, a number of icons at the top of the screen allow you access to various views and operations. 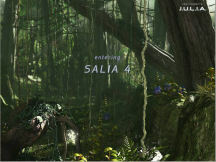 You spend the initial part of the game here, gathering minerals and repairing the ship. You will also come back here throughout the game to upgrade Mobot and access the planets in the solar system. When down on a planet, we have Mobot’s heads-up display sending back pictures and images, often overlayed by little diagrams or images generated by J.U.L.I.A. 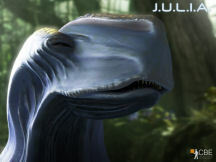 The planetscape is the main visual, with various “headshots” top left, depending on who is talking, and images of whatever Mobot is exploring bottom left. Dialogue options appear mid-screen, and some icons bottom right let you bring Mobot back to the ship when necessary. It might sound a little messy but it’s all rather clean and uncomplicated – check out a screenshot and you will see what I mean. The game has quite a lot of dialogue, and the story it reveals is rather a good one. A little clichéd at times, a bit chick-lit in one part, occasionally laborious, but a story worth telling and finding out. Ditto the graphics, with some little minuses but a plus overall. Rachel looks way too like a marionette for my liking, but you don’t see her a lot so it wasn’t a big issue. Some screens are a little dull, and some of the interfaces in space are a bit ho-hum, but the planetscapes are impressive and the cutscenes verge on being quite magnificent. Perhaps it’s that I haven’t had cutscenes in recent games, but I enjoyed these immensely. And ditto again on the voice acting. There is a narrative voiceover that you can choose not to have, and he was a bit pompous and didn’t add a whole lot, so I suspect when I play it again I will turn him off. Mobot was imbued with just the right amount of artificialness, and I suspect he was a distant cousin of Marvin’s, and perhaps J.U.L.I.A was a little too human although the emotion chip explained it, and thanks to Hollywood we are used to our A.I.s being almost people. There were times I wanted to slap Rachel, but it was more about her manner than what she was saying, and she tended to get over it fairly quickly. Taken as a whole, she managed to convey that somewhat on edge demeanour you might expect in her situation, and I warmed to her as we went. There are puzzles a-plenty, most being single screen in construction, requiring a varying degree of brain power. Some repeat, and the sixth planetary scan for minerals was about four too many, but there is variety throughout. You do all manner of “mechanical” things (rewire circuitry, decipher codes, reassemble images, construct items), as well as a few exploration based puzzles (map locations in a jungle, get Mobot out of a hole in the ice). Some of the more common types have also been tweaked to add a layer of complexity and to freshen them up – the double letter code decipher and reassembling the memory images are good cases in point. All have a little question-mark icon, which will tell you the objective or the rules, and only once did I think the rules could have been a bit clearer in how the particular puzzle worked. One puzzle has built-in help for the maths involved (it will in fact do the maths for you so don’t ask for help unless you actually want the puzzle solved), and many of the puzzles you can back out of or reset. There was one sequence type puzzle you couldn’t reset, which if you want to peek at a walkthrough makes things a bit more difficult. One puzzle will also literally tear your head off, or at least Mobot’s head, and it’s the actiony one and very annoying. I do actiony, but I didn’t do this. However, lose Mobot’s head three times and you get the option to skip it, so give it your best shot and move on. Exploring the planetary surface will often require you to find clues and items to gain access to buildings or other structures, and while you do collect items you don’t have an inventory. Mobot just uses what he finds if it’s the right thing to do, or he beams it up for you to decipher or fiddle with. Things learned on one planet may be needed on another. So depending on the order in which you visit them, you may not get terribly far before having to go elsewhere. However all of them are available to visit once the ship is spaceworthy. Looking back, it’s another game of bits. Except that with Ghost in the Sheet, I thought all the little bits prevented it from being better than it was. Here, the bits are irritants but they don’t prevent the game from achieving something rather good. It can be a bit melodramatic, the acting can be a bit strained, and Rachel does look only a little bit less artificial than J.U.L.I.A. But it does provide eight or so hours of thoughtful, enjoyable, story driven science fiction, a good number of well crafted and varied puzzles, and some excellent looking cutscenes. J.U.L.I.A. is a game I would happily recommend as being well worth the price of admission.